There are many reasons to have a will, but avoiding probate is not among them. Other tools such as a living trust can help achieve that goal. There are legal documents and procedures beyond having a valid Last Will & Testament that constitute “estate planning”. A person’s “estate” is his/her “net worth” at any moment. It is the sum of a person’s assets – legal rights, interests and entitlements to property of any kind – minus his/her liabilities (debts) at that time. Estate planning arranges for the disposal of a person’s estate. The goal is to eliminate uncertainty over probate administration and preserve an estate’s value by limiting taxes and expenses. Guardians are often designated for minor children and beneficiaries in incapacity. To simplify the process as much as possible for the survivors in dealing with the property left behind. The creation of a Will is the first step in the process of estate planning. While there are many good reasons to have a will, having a will is not enough. Often a second step is the creation of a “living trust”. The history of trusts dates back over 500 years when first used to protect an English nobleman’s property from the king. A trust is a legal entity that is created by a contract between at least two parties, for the benefit of a third party. The trust can own, buy and sell property. The original property in a trust comes from a “grantor” or “settlor”, who places designated property in the trust. The grantor contracts with a “trustee” to manage the property in accordance with the terms set out in the trust document as created by the grantor. The terms of the trust will name a third party (or parties) called a “beneficiary”, for whose benefit the trustee will manage the property, following the directions of the grantor. Probate is the often time consuming, complicated and expensive process of having a court oversee the disposition of the estate of a deceased individual. 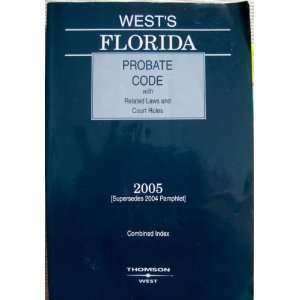 While varies a bit in its probate provisions, the process in Florida is typical. Having a will alone does not keep a person’s property out of probate. With only a will (or if there is no will at all), the court will still oversee the activities of an executor appointed by the will (or appointed by the court if there is no will). There are a variety of legal tools that can ease the transfer of ownership from a decedent to survivors that are outside the probate process. Many of these tools have to do with specific types of property ownership, such as joint tenancy or tenancy by the entirety or property with specific pay on death provisions of ownership. The broadest tool with the most flexibility and granting the greatest control to the estate owner is known as a “living trust”. Historically, the Living Trust was called an inter vivos trust, which is Latin for “among the living”. It is a trust created by someone during their lifetime. The trust becomes the legal owner of person’s property. Property can be put into a trust during a person’s lifetime, and with the proper provisions in a will, the trust may become the owner of any designated property a person owned at death. 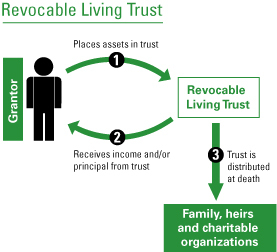 A Living Trust is usually revocable, that is it can be changed or terminated by the grantor at any time while he/she is alive. The trust continues to exist after a person dies. At death, the trust becomes irrevocable, meaning its terms can no longer be changed. Use of a living trust can provide significant protection for minor children by providing for their future needs. Any property placed in the trust by the grantor is owned by the trust. The trust is a legal entity separate from the grantor. For purposes of probate, the grantor does not own the property. As a result, property in the trust is not part of the grantor’s estate and is not subject to the court’s probate process. The property in the trust is handled by the trustee according to the trust directions set out by the grantor. This can include to whom, how much and when the property is to be given to the beneficiaries. The trustee does this without any oversight by a court, and can get the property to the designated beneficiaries much more quickly and simply than if there had only been a will that had to go through the probate process. This can vastly simplify life and expenses for the survivors.